Google reviews are publicly available via Google and they are a great way to share your experience of the business. Follow the steps in this article to quickly and easily write a review about a Local Business. (There are different ways you can do this, but this is the way that I find the easiest). Include the business name and their location eg suburb or city. Underneath their main website listing, select “Write a Review”, as shown in the underlined text in the second listing on the left in the screen shot below, or as seen in the button on the right, next to the green button for “2 circles”. You need to be logged in in order to write a review. If you’re not logged in, the log in screen will appear. If you’re already logged in, your name will appear in the top right hand corner of the search results. Share your experience of the business. This will help others decide whether to work with them. 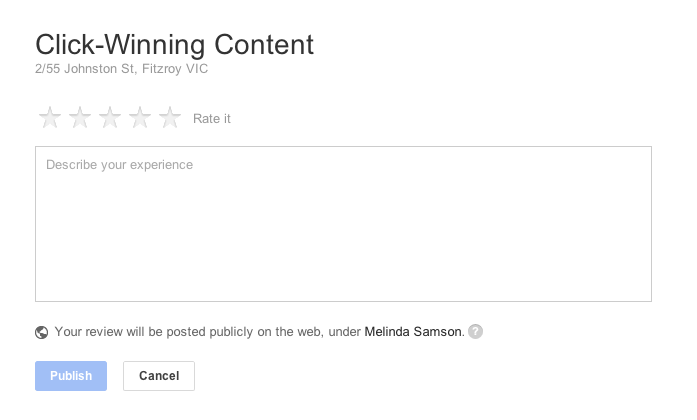 Click on the Google Reviews link to the left of “Write a Review”. For example, where it says “1 Google review” in the screen shot below. Then you’re done. That’s all it takes!